Product prices and availability are accurate as of 2019-04-12 18:19:24 EDT and are subject to change. Any price and availability information displayed on http://www.amazon.com/ at the time of purchase will apply to the purchase of this product. 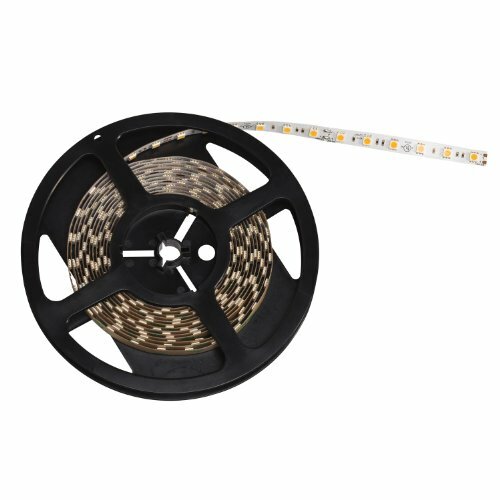 Kichler Lighting 120H40WH Task Work LED 20FT 4000K High Output 24V Indoor Dry Tape Light comes in a White finish with White LED and is versatile in design and flexible at every point in the installation. Applications can be easily cut and connected, so you can install jobs without interruption. Maximum run length is 20-feet. The tape can be cut every 4-Inch and reconnected with hardware available (sold separately, not included) from Kichler Lighting. The 3M adhesive backing assures easy peel and stick application that goes on strong and smooth – and stays that way. 120H40WH is 1IN wide x 20FT long. 120H40WH comes one 20FT roll per package. Since 1938, Kichler Lighting has offered a distinctive array of lighting solutions that reflect your individual personality, tastes and plans. Kichler brings you an unparalleled variety of exciting style families, unique finishes, fresh colors and unequaled quality. Whether its casual, contemporary, transitional or traditional, you'll find it with Kichler, lighting that defines your style.